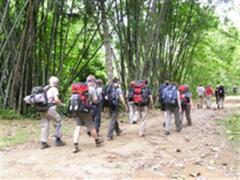 Trekking in Northern Thailand is enjoying immense popularity within the more adventurous and energetic travelers today. More tourists, whether they be young or the not so young, are opting to include this popular sport in their itineraries when booking for their travels. The activity is less ordered and pre-arranged as travel arrangements are based on the weather conditions and topography of the land rather than airline schedules and hotel bookings. More seasoned trekkers embark on longer hikes the world over as a means of seeing, absorbing & being a part of the culture of their destinations. You could enjoy and take in the rural scenes of less-traveled places. It allows you to also interact with nature and the rural folks. Trekking could be done wherever you want it to be. Popular spots include mountainous regions like the Himalayas and parts of Northern Thailand & throughout other areas of Asia. It has been an added attraction in the northern part of Thailand for the last two decades now. You can take pleasure in the lush and green scenery offered by the region and the winning hospitality by the indigenous hill tribes within the area. Experiencing Thai culture at this state can be totally exhilarating. You also have nothing to worry about as these hikes are safe and well-organized and seasoned guides are always available. Options are available for pretty much every kind of trekking adventure that you might prefer. Both Chiang Mai & Pai have established themselves as being pretty much the “trekking hubs” for all of Northern Thailand, there are lots of tour companies in both places but be wary of fake tour agencies & always book your tours with a T.A.T(Tourism Authority of Thailand) approved agent, as they have to meet exacting standards & also need to speak a reasonable amount of English. Another tip would be NOT to book any tours online. Book everything when you arrive, you will get EXACTLY what you want & it will be cheaper!!. A Northern Thailand trek adventure would normally take from three to five days. There are also shorter treks available for those who are not so into it. Activities typically range from simple leisurely strolls through rural villages to enjoy a taste of Thai culture – interacting with the hill tribe people, sharing meals with them, and having a first hand understanding of their way of living. Or! You can be more daring and go for activities such as elephant trekking, bamboo rafting and maybe some simple rock climbing or enjoying a refreshing swim in a jungle waterfall!. The best months to trek in Northern Thailand are between the months of November to May. Whatever it is you choose to do, it is important to pack simple and light. Bring essentials like: a pair of good light trekking boots (or running shoes), shirts, shorts, a pair of long pants, swimwear, towel, toiletries, first aid kit, mosquito repellent, flashlight (with spare batteries), sunblock, sunglasses, hat and lightweight sleeping bag or tent if need be. If you’re from the more temperate zones, include cool and light clothing for day wear, but remember to bring heavier clothing too, as night temperature can go pretty low - especially in the months of December and January, and DON’T FORGET YOUR DIGICAM!. Trekking in Northern Thailand could be one of your life’s greatest adventures! Author: Kevin Butters runs the website “Visit Chiang Mai Online” which provides real life experiences about Chiang Mai & Northern Thailand, to help visitors get the very best from their time spent in this most beautiful part of Thailand.